See their webpage on rabbit meat for more information. Since that time, and with no proof of that demand, they have expanded from their initial two regions to most of North America (Northern California, North Atlantic, Mid-Atlantic, Northeast, South, Pacific Northwest, Midwest, Florida, and the Washington, DC metro area). They are now auto-shipping rabbit meat to almost every store in the country, whether or not the store managers want the meat or not. Thanks to Whole Foods’ actions, Rabbit Advocacy Network (RAN) was founded. RAN is asking all Whole Foods customers to express their displeasure with Whole Foods’ decision to sell rabbit meat by boycotting the store and by informing other Whole Foods customers why they are no longer shopping there. We estimate that there are anywhere from 6-9 million pet rabbits in the United States, and we know that they are America’s third most popular companion mammal. This compares to 886,841 rabbits slaughtered by USDA inspected facilities in 2002, and in 2007, that number was 979,563. Since the USDA only inspects about 25% of rabbit processors, those numbers are at least three times higher, and Whole Foods aims to increase them yet further. Whole Foods Market is the largest natural foods grocery store in the US, with over 370 stores in North America. It’s the 99th largest retail chain in the world, and in the U.S. is only outranked by Walmart, Kroger, Safeway, Supervalu, Publix, and HEB. That means that by adding rabbit meat to Whole Foods stores, the company is both creating and inflating a demand for rabbit meat, meaning that hundreds of thousands–or even MILLIONS–more rabbits will be killed every single year in this country, simply to satisfy the demands of a few customers. Whole Foods, a store that is shopped at by millions of consumers who care about animals and don’t want them harmed, will now be adding, for the first time ever, a widely beloved pet to their meat cases in order to bring in the profits of those shoppers who have requested them. The rabbits raised for meat are exactly the same as the rabbits living in our homes, snoozing on our couches, begging for treats in the kitchen, and trading nose bonks with the family cat. These are the rabbits who will be bred over and over (Oz Farms, a Northern California grower, brags that “one rabbit can produce up to 320 pounds of meat in a year in just a small area” – Press Democrat, June 20, 2014) until they are spent, while their babies (called “fryers”) are slaughtered, with no protection from the Humane Methods of Slaughter Act. 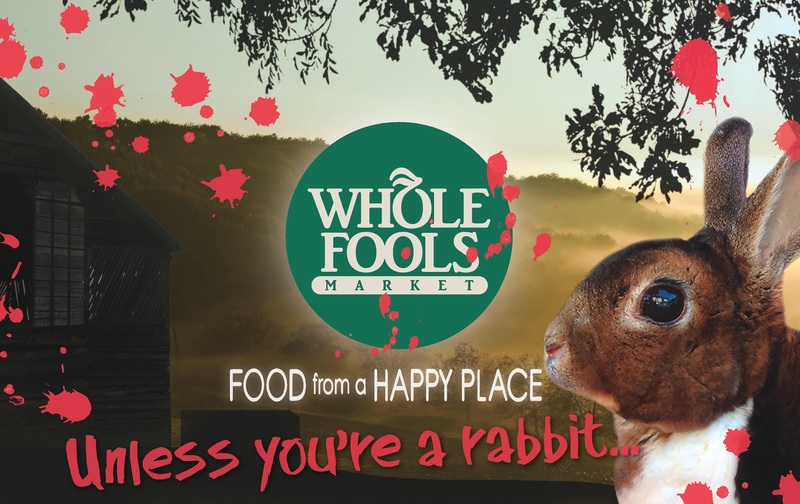 We have outlined exactly how Whole Foods’ rabbits are raised here, and slaughtered here. Please read these pages to find out exactly what Whole Foods’ “humane standards” mean. Whole Foods needs to hear from their customers, and all animal lovers, that this is not acceptable. 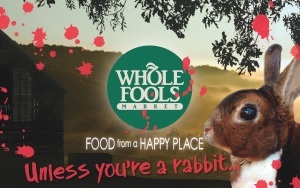 Please make your voices heard and tell Whole Foods to stop selling rabbit meat!